What amazes me is just wondering if our creator took more time when creating eyes of a Kenyan compared to other people in the world. Well Kenyans are always quick to notice the slightest thing that they can talk about. Judging from the event that took place in Naivasha during the New Year Eve where Nigerian artist Patoranking graced a big show where Nairobi Socialite Huddah Monroe attended while in a pair of tiny shorts that exposed her thighs. The well endowed socialite took to the stage to dance with the artist and people were too quick to notice some funny marks on her inner thighs and quickly took some photos to social media claiming it was a ‘skin disease’ possibly because of too much s3x. 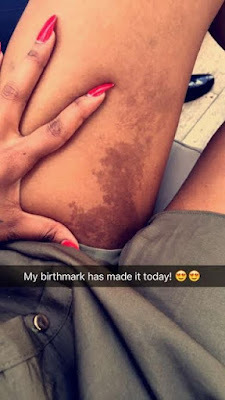 Huddah Monroe was too quick to defend her reputation as she claims its only a birth mark.